When I visited New York earlier this year I made a big, no huge, list of places I wanted to eat. You know, important things first. One of the spots on my extensive foodie inventory was Four and Twenty Blackbirds pie shop in Brooklyn so I could try their famous salty honey pie. I’ve always wanted to visit a pie shop after falling in love with the Pie Hole in Pushing Daisies, so I was beyond thrilled to find this little beauty. Doubly so when I discovered it was across the road from The Morbid Anatomy Museum, one of the big stops of our trip. While indulging in copious amounts of pie I also managed to pick up a copy of the Four and Twenty cookbook , you know, so I could continue to indulge my greedy little face back home. 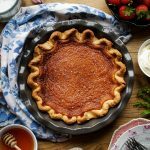 I decided to take it for a spin recently and just had to make their crowning glory, the salty honey pie. 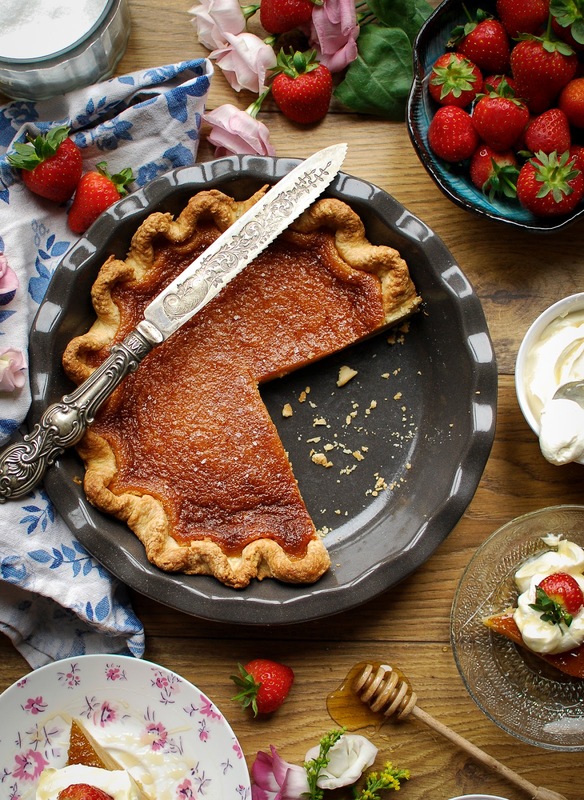 This pie, ahh man, it’s a sweet tooth’s dream come true. Deliciously sweet custard topped with a sprinkle of crunchy salt, it’s just perfect. Irresistible almost! I’ve made this pie twice now, the first time I was feeling a little lazy and used shop bought pastry. Boo hiss. It was a total failure, if you do decide to make this pie I implore you to make your own crust. You won’t be sorry! 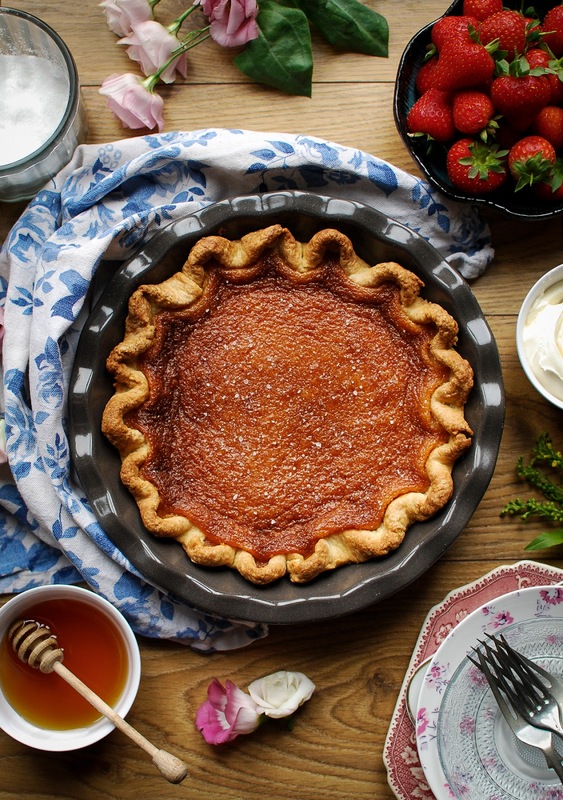 This salty honey pie from Four and Twenty Blackbirds has a deliciously sweet custard topped with a sprinkle of crunchy salt, it’s just perfect. Irresistible almost! First of all make the crust. Put the flour, butter, sugar, and salt in a large mixing bowl blend together with your fingers until the mixture resembles coarse crumbs. Add the buttermilk and stir until the mixture forms a ball. (If the mixture is too crumbly, add cold water as needed to bring it together.) Wrap the dough in plastic wrap and place in the fridge for at least an hour. Unwrap the dough and place it on a lightly floured surface. With a rolling pin, roll out the dough until it’s around 11″ round, big enough to overlap your pie dish. Transfer the dough to a 9″ pie dish, fold any overlap under itself and crimp the edges*. Cover with plastic wrap and pop in the fridge while you prepare the filling. Heat the oven to 175°C. Melt the butter in a small saucepan over medium-low heat. Combine the melted butter, sugar, polenta and vanilla extract in a medium bowl. Whisk in the honey, then beat in the eggs one at a time. Add the cream and vinegar and whisk to combine. Pour the filling into the chilled pie crust and bake until the top and edge of the pie are golden brown and the centre of the pie is jiggly but no longer liquid, 45 to 55 minutes. Allow to set for a few hours and serve at room temperature sprinkled with flaked salt. I would like to know where I can gat a knife like that. looks amazing.